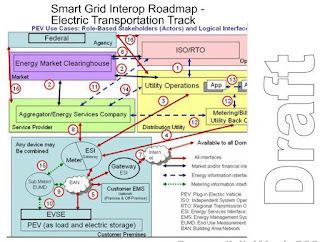 NIST developed a roadmap for Electric Transportation standards as one of the "Four Priority Functionalities" that was identified by FERC in their draft "Smart Grid Policy"
For each functional priority, use cases were collected, reviewed for “architectural significance”, and a representative subset was chosen. These use cases were rigorously exercised, modified and completed by workshop participants. Workshop participants also performed requirements and gap analysis. PEV will add significantly to the load that the power system will have to serve, and if no regulation, coordination, and/or incentives are included, then PEV could significantly increase the cost of peak power. PEV, although still adding to the load, will help balance on- and off-peak loads through shifting when they are charged and also eventually by providing storage and discharging capacity. Additional ancillary services could also improve energy efficiency and power quality. These shifting strategies will result from carefully tailored pricing and market incentives. Communication standards for electric vehicles is a priority area due to the potential integration of vehicle batteries as a grid resource, as well as the recognition that vehicle charging will add significant load to the grid. Different organizations are looking at different elements of the communications issues and coordination of these efforts is required. NIST expects that coordination can be monitored and encouraged through a task group effort. The standards are now being developed, but implementations are lacking. Currently, the center of standards development work is SAE, and NIST is encouraging cooperation with the efforts listed in the following acronyms/definitions section. 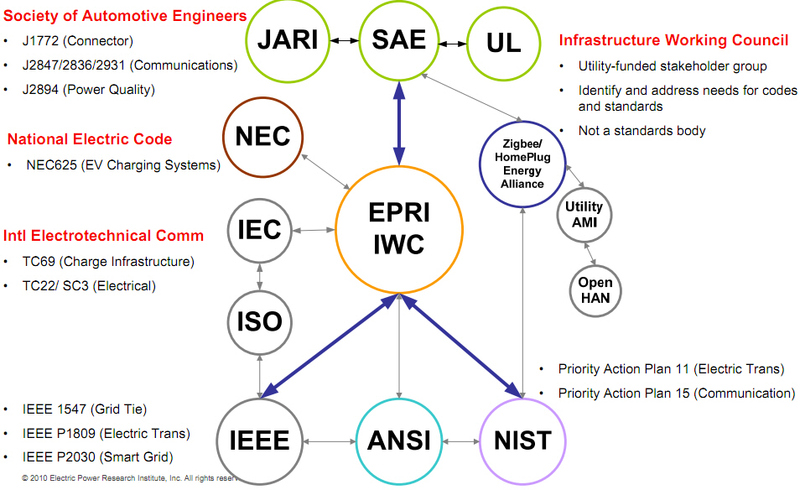 ESI - Energy Services Interface - Provides cyber security and, often, coordination functions that enable secure interactions between relevant Home Area Network Devices and the Utility. Permits applications, such as remote load control, monitoring and control of distributed generation, in-home display of customer usage, reading of non-energy meters, and integration with building management systems. Provides auditing/logging functions that record transactions to and from Home. EUMD - End Use Measurement Device - A device that measures energy consumed by a PEV and communicates the information to the ESI. SAE -J1772- Device standard for Electric Vehicle Conductive Coupler –Work to develop a universal coupler–Data Transfer. The Society of Automotive Engineers plans to vote on the J1772 standard for equipment to charge plug-in hybrid and all-electric cars the week of October 26, a move that would make it easier for consumers to refuel cars. The SAE has been working on the standard for the past two and half years. SAE J2836 - Recommended Practice for Communication between Plug-in Vehicles and the Utility Grid. Provides the automotive standards for Vehicle to Utility communications message structures and formats. Will adopt Smart Energy Profile 2.0 Message structures. Primary purpose of J2836 is grid-optimized energy transfer for plug-in electric vehicles–that is, ensuring that vehicle operators have sufficient energy for driving while managing charging of vehicles in ways that minimize stress upon the grid. Also addresses the following requirements: secure two-way communication with the Energy Services Communication Interface (i.e., Utility), time- or price-based charging preferences based on current electric rate/tier, vehicle charging at any voltage, vehicle roaming and unified billing infrastructure, and customer override/opt-out. Sub Meter - A meter that measures a sub load, such as a plug-in electric vehicle. UL - Underwriters Laboratories - A nonprofit, independent organization that develops standards for product safety and conducts testing activities based on its own and other test procedures. UL 1741 - Standard for Inverters, Converters, and Controllers for Use in Independent Power Systems. Combines product safety requirements with the utility interconnection requirements developed in the IEEE 1547 standard to provide a testing standard to evaluate and certify distributed generation products. FERC has said that it intends for the smart grid to accommodate a wide array of advanced options for EV interaction with the grid. It has encouraged NIST to focus on the development of standards, or extensions of current standards, to provide at least the minimum communications and interoperability requirements that are necessary to permit distribution utilities to facilitate vehicle charging during off peak load periods. Upgrades to dated communications systems between EVs and the grid need to occur. Customer Does Not Enroll in Any PEV-Specific Program - The customer plugs a PEV into electrical connections that do not have smart meters or any other communications capabilities. The PEV may or may not be registered in a program, but cannot take full advantage of it without a smart meter. The utility has neither direct knowledge of the PEV load nor any real-time or near-real-time information on PEV charging, due to the lack of communications. Utility/ESP Develops Different Tariffs and Service Programs - The utility or Energy Services Provider develops a variety of PEV programs, based on different tariffs, different types and levels of services, different PEV response capabilities and requirements, as well as different rate structures for Time-of-Use (TOU), Real-Time Pricing (RTP), Critical Peak Pricing (CPP), Peak Demand Limited, Customer Demand Limited, Unlimited, Pre-Payment, No Roaming, etc. PEV Charges After Customer Establishes Charging Parameters - PEV customers have different methods for establishing how and when their PEVs are charged, depending upon their location and constraints. PEV Charges at Different Locations: Roaming Scenarios - The customer plugs the PEV into the grid at a location different from their “home” location. Different scenarios address who and how the PEV charging will be accounted for and billed. V to L: Use of the PEV storage to provide power to a remote site or load that does not otherwise have electrical service. Examples include construction sites or camp sites. Utility Provides Accounting Services to PEV Customer - Based on the PEV program and tariff that the PEV customer has enrolled in, the utility or other accounting entity will issue bills to those PEV customers as well as providing other customer accounting services. These bills will be based on on-premise and off-premise meter (and/or sub-meter) readings for the appropriate time periods with the appropriate prices applied. Impact of PEV as Load on Distribution Operations - Distribution operations will need to access all available sources of information on when, where, and how fast PEVs are charging, particularly as this load becomes increasingly more significant at local and more global levels. PEV Network Testing, Diagnostics, and Maintenance - As part of PEV Program services, the ESP provides services for testing, running diagnostics, and providing maintenance for the customer’s PEV interface system (EVSE) and battery. NIST identified three principle gaps in the area of Electric Transportation and the Smart Grid. Payment Schemes - Models for settlement of energy costs and payments are developing slowly, with significant technical and policy/regulatory barriers. Proposals range from complex schemes for billing back to the driver’s (or the owner’s) home utility, simple charging as with current gasoline stations, to mixtures of prepaid and billed services as with cellular phones. When charging stations are ubiquitous, these issues will become even more important. Mobile loads stress the distribution infrastructure. Similar approaches to those used for non-mobile loads point to two related gaps: a common model for Demand-Response signals (grid safety, and pricing for demand shaping), and a common model for price, energy characteristics, and time for use. There are alternatives, including very specific demand control mechanisms, but the benefits of applying economic demand shaping appear to be much greater, particularly given the growth of Demand-Response use in other customer areas. V2G - NIST recognizes that electric transportation will have a dual role as both a load to be managed and as a potential power source. Additionally, the impact of the PEVs on the planning and the management distribution system and its impact on system protection should be considered. Communications Infrastructure - PEVs will require reliable and secure communications with the equipment within customer premises and with utilities and energy service providers, in order to manage the different tariffs and service programs which would allow PEVs to participate in demand response and other interactive programs. Feedback on Charging - Distribution operations will need to access all available sources of information on when, where, and how fast PEVs are charging, particularly as this load becomes increasingly more significant at local and more global levels. Analysis Tools - Distribution operations will also need power system models and appropriate analysis tools. First the raw load data (and any load forecast data) must be mapped to the power system model. Then the analysis tools will need to estimate the real load (and power system topology and facilities connectivity). Develop and standardize common object models – SAE is developing the requirements as well as providing the definitions for data exchanges of PEVs, chargers, metering equipment, registration equipment, and other PEV-related equipment. However, they need to pass these data requirements and definitions to a standards organization for mapping into actual object models. 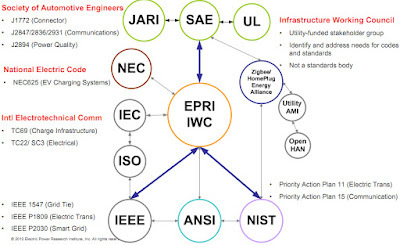 NIST shall communicate with SAE, IEEE, IEC, UCA, OASIS to identify and select a Standard Development Organization for pricing model, DR signal standard, and scheduling standard. Develop storage device electrical interconnection guidelines. NIST plans to issue a request to IEEE SCC 21 that the IEEE 1547 working group recruit domain experts in energy storage devices and update or augment the 1547 standards series as appropriate to accommodate energy storage system specific requirements. Coordination with UL and SAE may be required for electric vehicle based storage systems. Develop storage device specific common information model. NIST plans to issue a request to IEC TC 57 WG17 to recruit domain experts in energy storage devices and update or augment the 61850-7-420 standard as appropriate to accommodate energy storage system specific requirements. Both utilities and automotive manufacturers have agreed to jointly pursue standardization activity that will enable the PEVs to act as just another appliance on the AMI or HAN. 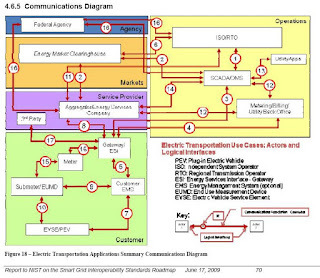 Two activities within SAE, under J2836 (use cases) and J2847 (data specification) with extensive automotive and utility participation, are in the process of defining the requirements for PEV to Smart Grid communications, which will enable the PEVs to be utility-controllable distributed resources for load shifting, demand response, and pricing-signaling purposes. ZigBee Alliance and HomePlug Alliance have created the Smart Energy Initiative, which is crafting the Smart Energy 2.0 (SE2.0) specification for AMI and HAN applicability. SAEJ2836/J2847 and SE2.0 teams are working together to coordinate the data exchange requirements between Smart Grid and PEVs. A draft Marketing Requirements Document (MRD) and Technical Requirements Document (TRD) are currently being refined for late 2010 ratification. SE2.0 and J2847 are expected to define a consistent set of data specifications for the charging load of the PEVs to be controllable by the same utility load management systems that determine demand response and load control signals for other loads, such as air conditioners, smart thermostats, or other smart appliances. The SAEJ2836 use cases include enabling PEV owners to enroll into utility demand response, load control and special incentive pricing programs and then program their vehicles to accept or reject utility requests for participating in demand response, load control and critical peak pricing-related events. In August 2011, Ford and Toyota announced that the car companies are working together on standards for the next-generation of networking and Internet-connected services in their vehicles. The standards they are working on would cover areas like connectivity for WiFi and bluetooth in the car, and back-end infrastructure that provides the data for the in-vehicle services. California Cars Initiative, Palo Alto CA - A nonprofit startup of entrepreneurs, engineers, environmentalists and consumers promoting 100+MPG PHEV. Somewhat uniquely, they see themselves as a hybrid, focusing both on public policy and technology development, and harnessing buyer demand to help commercialize PHEVs. The Electrification Coalition is a nonpartisan, not-for-profit organization committed to promoting policies and actions that will facilitate the deployment of electric vehicles on a mass scale. Their manifesto states By 2040, 75 percent of the light-duty vehicle miles traveled (VMT) in the United States should be electric miles. As a result, oil consumption in the lightduty fleet would be reduced to just 2.0 mbd, compared to today’s level of 8.6 mbd, and it is conceivable that U.S. oil imports could effectively be reduced to zero. Peter L. Corsell, CEO, GridPoint, Inc.
Carlos Ghosn, President & CEO, Nissan Motor Company, Ltd.
Richard Lowenthal, Founder & CEO, Coulomb Technologies, Inc.
Reuben Munger, Chairman, Bright Automotive, Inc.
As its first official act, the Coalition released the Electrification Roadmap, a sweeping report detailing the dangers of oil dependence, explaining the benefits of electrification, describing the challenges facing electric cars, and providing specific policy proposals to overcome those challenges. 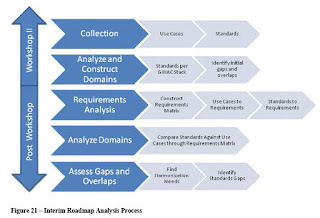 PRTM, a global management consulting firm, provided market analysis and technical input for the Roadmap, including detailed modeling on vehicle costs. I just wanted to thank you for the very wonderful effort you put in this blog.